Electrophilic aromatic substitution (SEAr) is an organic reaction in which an atom that is attached to an aromatic system (usually hydrogen) is replaced by an electrophile. Some of the most important electrophilic aromatic substitutions are aromatic nitration, aromatic halogenation, aromatic sulfonation, and acylation and alkylating Friedel–Crafts reactions. Approximately 24,700,000 tons were produced in 1999. (After dehydrogenation and polymerization, the commodity plastic polystyrene is produced.) In this process, solid acids are used as catalyst to generate the incipient carbocation. Many other electrophilic reactions of benzene are conducted, although on much smaller scale, they are valuable routes to key intermediates. The nitration of benzene is achieved via the action of the nitronium ion as the electrophile. The sulfonation with fuming sulfuric acid gives benzenesulfonic acid. Aromatic halogenation with bromine, chlorine, or iodine gives the corresponding aryl halides. This reaction is typically catalyzed by the corresponding iron or aluminum trihalide. The Friedel–Crafts reaction can be performed either as an acylation or as an alkylation. Often, aluminium trichloride is used, but almost any strong Lewis acid can be applied. For the acylation reaction a stoichiometric amount of aluminum trichloride is required. Both the regioselectivity and the speed of an electrophilic aromatic substitution are affected by the substituents already attached to the benzene ring. In terms of regioselectivity, some groups promote substitution at the ortho or para positions, while other groups increase substitution at the meta position. These groups are called either ortho–para directing or meta directing. In addition, some groups will increase the rate of reaction (activating) while others will decrease the rate (deactivating). While the patterns of regioselectivity can be explained with resonance structures, the influence on kinetics can be explained by both resonance structures and the inductive effect. Substituents can generally be divided into two classes regarding electrophilic substitution: activating and deactivating towards the aromatic ring. Activating substituents or activating groups stabilize the cationic intermediate formed during the substitution by donating electrons into the ring system, by either inductive effect or resonance effects. Examples of activated aromatic rings are toluene, aniline and phenol. The extra electron density delivered into the ring by the substituent is not distributed evenly over the entire ring but is concentrated on atoms 2, 4 and 6 (the ortho and para positions). These positions are thus the most reactive towards an electron-poor electrophile. The highest electron density is located on both ortho and para positions, although this increased reactivity might be offset by steric hindrance between substituent and electrophile. The final result of the electrophilic aromatic substitution might thus be hard to predict, and it is usually only established by doing the reaction and determining the ratio of ortho versus para substitution. On the other hand, deactivating substituents destabilize the intermediate cation and thus decrease the reaction rate. They do so by withdrawing electron density from the aromatic ring, although the positions most affected are again the ortho and para ones. This means that the most reactive positions (or, least unreactive) are the meta ones (atoms 3 and 5). Examples of deactivated aromatic rings are nitrobenzene, benzaldehyde and trifluoromethylbenzene. The deactivation of the aromatic system also means that generally harsher conditions are required to drive the reaction to completion. An example of this is the nitration of toluene during the production of trinitrotoluene (TNT). 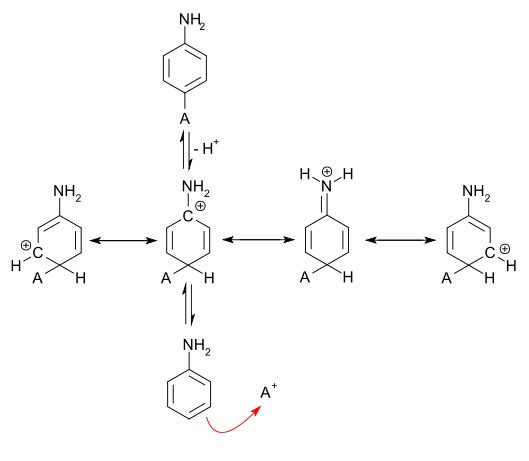 While the first nitration, on the activated toluene ring, can be done at room temperature and with dilute acid, the second one, on the deactivated nitrotoluene ring, already needs prolonged heating and more concentrated acid, and the third one, on very strongly deactivated dinitrotoluene, has to be done in boiling concentrated sulfuric acid. Functional groups thus usually tend to favor one or two of these positions above the others; that is, they direct the electrophile to specific positions. A functional group that tends to direct attacking electrophiles to the meta position, for example, is said to be meta-directing. Groups with unshared pairs of electrons, such as the amino group of aniline, are strongly activating and ortho/para-directing. Such activating groups donate those unshared electrons to the pi system. When the electrophile attacks the ortho and para positions of aniline, the nitrogen atom can donate electron density to the pi system (forming an iminium ion), giving four resonance structures (as opposed to three in the basic reaction). This substantially enhances the stability of the cationic intermediate. When the electrophile attacks the meta position, the nitrogen atom cannot donate electron density to the pi system, giving only three resonance contributors. This reasoning is consistent with low yields of meta-substituted product. Other substituents, such as the alkyl and aryl substituents, may also donate electron density to the pi system; however, since they lack an available unshared pair of electrons, their ability to do this is rather limited. Thus, they only weakly activate the ring and do not strongly disfavor the meta position. Halogens are ortho/para directors, since they possess an unshared pair of electrons just as nitrogen does. However, the stability this provides is offset by the fact that halogens are substantially more electronegative than carbon, and thus draw electron density away from the pi system. This destabilizes the cationic intermediate, and EAS occurs less readily. Halogens are therefore deactivating groups. Directed ortho metalation is a special type of EAS with special ortho directors. Non-halogen groups with atoms that are more electronegative than carbon, such as a carboxylic acid group (CO2H) draw substantial electron density from the pi system. These groups are strongly deactivating groups. Additionally, since the substituted carbon is already electron-poor, the resonance contributor with a positive charge on this carbon (produced by ortho/para attack) is less stable than the others. Therefore, these electron-withdrawing groups are meta directing. 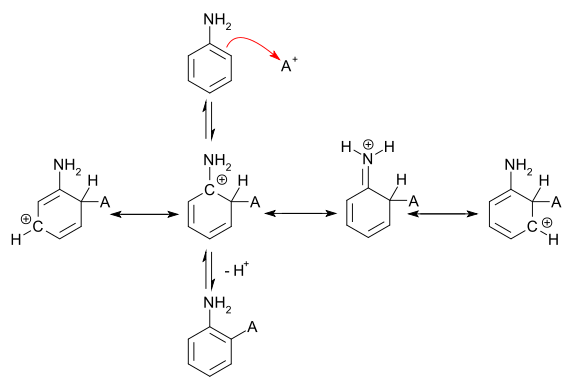 In the first step of the reaction mechanism for this reaction, the electron-rich aromatic ring, which in the simplest case is benzene, attacks the electrophile A. This step leads to the formation of a positively charged cyclohexadienyl cation, also known as an arenium ion. This carbocation is unstable, owing both to the positive charge on the molecule and to the temporary loss of aromaticity. However, the cyclohexadienyl cation is partially stabilized by resonance, which allows the positive charge to be distributed over three carbon atoms. 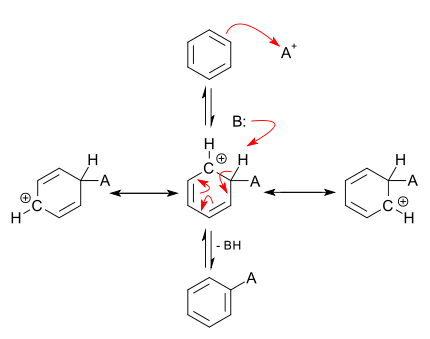 In the second stage of the reaction, a Brønsted base B donates electrons to the hydrogen atom at the point of electrophilic attack, and the electrons shared by the hydrogen return to the pi system, restoring aromaticity. An electrophilic substitution reaction on benzene does not always result in monosubstitution. While electrophilic substituents usually withdraw electrons from the aromatic ring and thus deactivate it against further reaction, a sufficiently strong electrophile can perform a second or even a third substitution. This is especially the case with the use of catalysts. The Ipso substitution is a special case of electrophilic aromatic substitution where the leaving group is not hydrogen. A classic example is the reaction of salicylic acid with a mixture of nitric and sulfuric acid to form picric acid. The nitration of the 2 position involves the loss of CO2 as the leaving group. Desulfonation in which a sulfonyl group is substituted by a proton is a common example. See also Hayashi rearrangement. In aromatics substituted by silicon, the silicon reacts by ipso substitution. Compared to benzene, furans, thiophenes, and pyrroles are more susceptible to electrophilic attack. These compounds all contain an atom with an unshared pair of electrons (oxygen, sulphur, or nitrogen) as a member of the aromatic ring, which substantially stabilizes the cationic intermediate. Examples of electrophilic substitutions to pyrrole are the Pictet–Spengler reaction and the Bischler–Napieralski reaction. 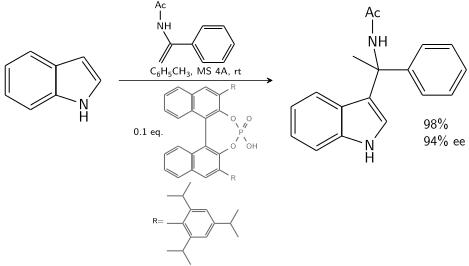 In the presence of 10-20 % chiral catalyst, 80–90% ee is achievable. Other reactions that follow an electrophilic aromatic substitution pattern are a group of aromatic formylation reactions including the Vilsmeier–Haack reaction, the Gattermann Koch reaction and the Reimer–Tiemann reaction. Other electrophiles are aromatic diazonium salts in diazonium couplings, carbon dioxide in the Kolbe–Schmitt reaction and activated carbonyl groups in the Pechmann condensation. 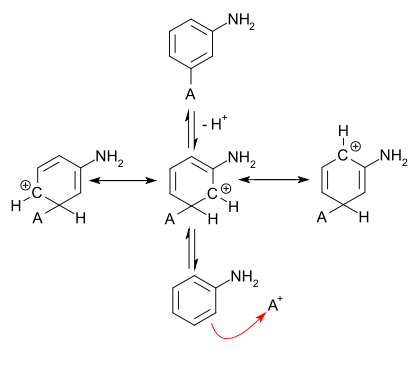 In the multistep Lehmstedt–Tanasescu reaction, one of the electrophiles is a N-nitroso intermediate.